The Canadian Mortgage and Housing Corporation (CMHC) has useful tools for homebuyers to get a better understanding of the housing market. Some homebuying tools the CMHC has includes the Debt Service Calculator which gives homebuyers the opportunity to evaluate their current financial situation in order to determine how much they can comfortably afford to spend on a mortgage. Another tool is the Mortgage Payment Calculator that calculates the mortgage amounts and their frequency. For a look at more tools, click here. This mobile app put out by the CMHC allows homebuyers, especially first-time homebuyers, to make informed choices during the homebuying process. This is available to iOS, Android and Blackberry. This resource provides information for newcomers in regards to renting or purchasing a home in Canada. For all your real estate needs, contact Amalia Liapis at 604-618-7000 or alternatively at amalia@wesellvancouver.ca. Premier Christy Clark has recently announced a new loan program called the BC Home Owner Mortgage and Equity (HOME) Partnership Program that will assist first-time home buyers by contributing to your personal down payment. The government will lend the buyer funds equal to the down payment up to $37,500, or 5% of the purchase price. This new loan would be granted to Canadian citizens or permanent residents who have never previously owned a property and is only applicable to residences with a maximum purchase price of $750,000. This will be an interest-free and payment-free loan for the first five years. After that period, buyers can then either repay their loan or enter into monthly payments at current interest rates. These loans will become due after 25 years, which is the typical length of most mortgages. Applications will be accepted on January 16, 2017 and the program comes to an end on March 31, 2020. Additional information can be found here. As mentioned previously, this program is for first-time homebuyers. All individuals applying that have a registered interest on title must reside in the home. In addition, you will find other requirements as seen below. As of February 19, 2014, the BC Government has implemented a tax break for first-time home owners and can be used in conjunction with the BC HOME Partnership Program. The First Time Home Buyers’ Program reduces or eliminates the amount of property transfer tax paid on your first home. We blogged about this back in 2014 and you can view it here. Our blog outlines both homeowner and property requirements. For all your real estate needs, contact the WeSellVancouver team at 604-801-6654 or alternatively at info@wesellvancouver.ca. We look forward to hearing from you! Join us in this three part series on Canada's financial perspective featuring blogs on the (1) Mortgage Rate Outlook (2) Economic Outlook and (3) Interest Rate Outlook. Looking back at 2015, the first half of the year saw negative growth but looking at the big picture reveals a registered economic growth of 1.2%. Multiple factors attributing to the slow economic growth in 2015 has trickled into 2016 as well such as the low oil prices and the related adverse effects on income and job growth. With the newly elected federal government in place, there is an effort to utilizing old-fashioned fiscal policy in order to boost economic growth. The range for the estimate of the fiscal multiplier for Canada ranges from 0.5 to 1.5. The fiscal multiplier is a ratio that shows the effect of government spending on economic activity. However, the level of impact of fiscal policy is highly interdependent on the state of the economy. BCREA's current forecast for the Canadian economy is for economic growth of 1.6% in 2016 and 2.5% in the following year, taking into account the impact of expansionary fiscal policy. Stay tuned for the last part of the blog series where we'll dive into the Interest Rate Outlook. For all your real estate needs, contact Amalia Liapis at amalia@wesellvancouver.ca or alternatively, at 604-618-7000. The financial markets have seen tremendous volatility thus far with record low oil prices with consumers and investors being more risk averse as a result. This risk aversion has overwhelmed any potential pressure on yields from bonds that may have arisen due to the US Federal Reserve tightening the monetary policy. In Q1 of 2016, Canadian bond yields dropped to a low of 0.48% but have bounced back to 0.8%. Bond yields may continue to see a rise due to the anticipation of economic growth towards year end. Despite the volatility in the financial market, there is a silver lining for home buyers as it is keeping the mortgage rates low for the time being. Take a look below at the forecasts for both 2016 and 2017. The one-year mortgage rates are seeing a slight increase towards Q4, however, the five-year rates are expected to be stabilized at 4.64% for the entirety of 2016 which is good news for home buyers! Stay tuned for the next part of the blog series where we'll dive into the Economic Outlook. For all your real estate needs, contact Amalia Liapis at amalia@wesellvancouver.ca or alternatively, at 604-618-7000. Mortgage Rates Reach Historic Lows! With a major decrease in Canadian bond yields to 0.52 as of March 27, 2015. The plummet in bond yields is in part due to the surprise rate cut at the Bank of Canada's meeting in January. 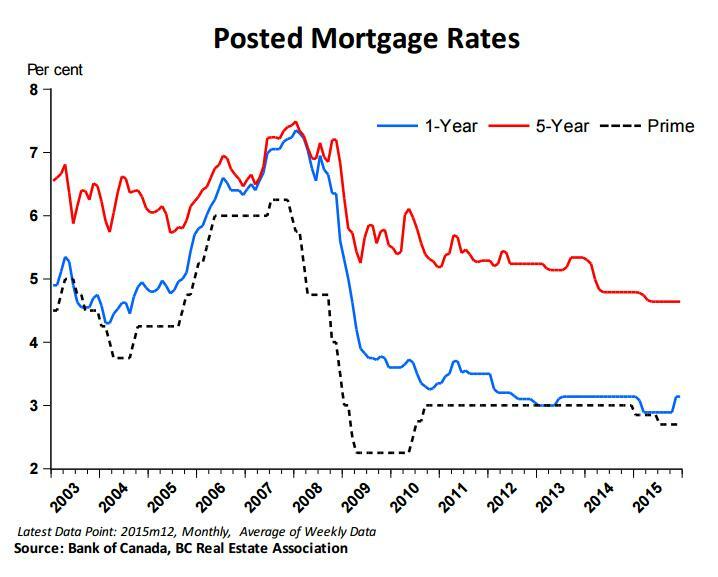 In spite of that, posted mortgage rates have moved slightly lower and banks passed through only a partial amount of the 25 basis point rate cut to prime rates that govern variable mortgages. The forecasts for future rate decisions have seen fluctuation. The five-year bond yield hit a record low of 0.59% but has since rebounded. The five-year fixed mortgage rate is currently at 4.74% which may be the absolute floor. The 0.75% decline in the five-year bond yield translated to only a 0.04% reduction in the qualifying rate. 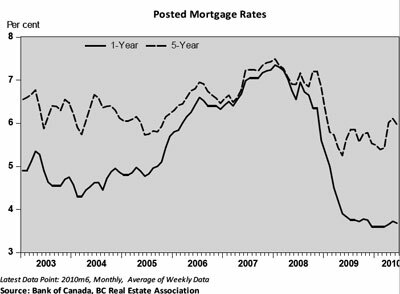 It may be a while before mortgage rates move substantially higher. The mortgage rate forecast for 2015 and 2016 are shown below. Projections show that mortgage rates will continue to stay at historic lows for the remainder of the year. As the Canadian economy rebounds from the decline in oil prices and if the US Federal Reserve begins to tighten in the summer months, we may see some upward pressure on long-term interest rates in the last quarter of this year and into 2016. Once you have chosen a location and narrowed down your housing choices to *the* one, you have to think about financing options. Lucky for you, most financial institutions offer "green" mortgages. Making eco-friendly decisions will save the environment and some money while you're at it. This is a five-year fixed closed mortgage that rewards you for planning to purchase or already owning a home with energy efficient features. Members are qualified for a great rate when they apply under a BMO representative. This mortgage features prepayment options that will allow you to pay down your mortgage faster and reduce your interest costs. Have peace of mind in knowing that your mortgage rate will not rise during the term. For additional information, check out the BMO Eco Smart Mortgage. If eligible, you could receive a $300 rebate on a home energy audit. What exactly is a home energy audit? It is a report assessing your home's major heating and cooling systems. A licensed professional will be able to make recommendations as to how you can improve your home's energy efficiency and lower your energy costs. For more details on energy and money saving tips, visit RBC's Energy Saver Mortgage. Making energy-efficient renovations has its advantages, both economically and environmentally. With these renovations, you can increase your home's re-sale value by having an energy efficiency rating which informs buyers that your home is more energy efficient. You will also be able to improve the efficiency of your home in the short and long-term. These renovations translate into cost-savings by offering you a personal loan at prime + 1% rate for up to ten years. Mortgage rates are low and the payment options are flexible! Innovative programs are being launched to help home owners and businesses leverage home renovations for energy efficient improvements. This financing model spreads out the cost of the renovations over a substantial period of time in which the energy savings from said renovations will help pay for the financial loan through BC Hydro or FortisBC. Contact us today if you have any questions and we'll be more than happy to assist you in any way possible. E-mail us at info@wesellvancouver.ca or give us a ring at 604-801-6654. Purchasing a home in itself can be stressful enough. Being bombarded with unfamiliar jargon can add to that stress. Fortunately for you, we've created a helpful cheat sheet that will make you a mortgage expert in no time! While this financing tool is generally not in the forefront in terms of mortgage plans, it has definitely been around for quite some time. With a collateral mortgage, you still have some elements of a conventional mortgage such as a predetermined interest rate and term. This loan agreement is secured by the collateral security of a mortgage against your home. Depending on the lender, you may be able to have your mortgage registered for up to 125% of its value. - You're able to separate different portions of your mortgage for tax purposes. - Easy to tap into your equity for debt consolidation, renovations or to invest in property or investments easily and in a cost effective manner. In addition, there are no legal fees associated with this. - No freedom to switch or transfer to another lender like a conventional mortgage. If you're wanting to switch to another lender for their attractive interest rates or features, you must start from the beginning which generally means incurring legal costs of $500-$1000. This concludes our 4-part series. Hopefully we have equipped you with the tools necessary to be able to make wise decisions on what plan is best suited for your needs. Good luck in choosing a plan that is perfect for you! It is a basic, bare-bones fixed-rate mortgage. While the rates quoted are generally quite low, there are some downsides to the low rates which we will touch base on below. By the end of this 4-part series, you'll be well informed on the various elements involved in mortgage plans and you'll be able to decide on what plan is best suited for your needs. Additional Payments: This option is simply where you can opt into making additional payments towards your mortgage with one lumpsum payment or several lump sum payments. Increased Payments: This option allows you to increase the payment amount arranged annually. This can often be done in conjunction with the additional payments. Lump Sum Payments: Most lending institutions allow you to make large lump sum payments towards your principal. In doing so, you will rapidly decrease your balance owing. - No real disadvantage considering these are just options that are available for mortgage repayments. - If you don't foresee any extra money in your budget, you may not want to consider the options available for prepayment privileges. Every lending institution has different policies on their prepayment privileges terms so consult your lender to determine what mortgage plan is right for you. Your mortgage rate will fluctuate with any changes with the current prime interest rate. In essence, if the prime rate declines, more of your payment will go towards paying off your principal. However, if the prime rate increases, more of your payment will go towards covering interest costs. As a whole, you may end up paying a lower average rate in comparison to a fixed-rate mortgage. If interest rates are cliombing, you can switch over to a fixed-rate mortgage. - Due to the fluctuations, any decreases in the prime rate will work in your favor. - Generally variable-rates are lower than fixed-rates as a way to compensate for the risk factor. - More risk involved due to the lack of security & stability. - Financial uncertainty - Significant increases in prime rate will increase your interest payable which will consequently increase your financial burden. Is record household debt a problem for home owners? Continuous bad news about rising Canadian debt has been making headlines for the past few years – and now we’re hearing over and over again that mortgage debt has reached epic proportions. Is all of this negativity accurate? We decided to find out by asking some credible sources. The truth about household debt. It is true: the overall household debt of Canadians is at a record of $1.5 trillion, growing from $147 billion in 1982. Two-thirds of the increase from 1982 - 2010 occurred from 1999 - 2010. The largest component of debt among households is residential mortgages which account for two-thirds of all household debt. The debt has kept pace with home prices, and is larger in BC and Ontario than other provinces. In 2010, residential mortgages represented about 68% of total household debt. This compares to a low of 63% in 1971 and a high of 75% in 1993, during the 1971- 2010 period. The largest component of debt among households is residential mortgages which account for two-thirds of all household debt. This debt has kept pace with home prices, and is larger in BC and Ontario than other provinces. In 2010, residential mortgages represented about 68% of total household debt. This compares to a low of 63% in 1971 and a high of 75% in 1993, during the 1971 – 2010 period. Why have we seen high mortgage debt? beginning in 2009, sudden lower income growth as a result of the global economic depression. Mortgage holders are also typically younger, who have bought their home within five years, and who carry higher mortgage debt than those who have been in their homes longer. How does mortgage debt compare with other debt? In 2010, residential mortgages represented 58% of total household debt held by chartered banks. Consumer credit accounted for 42%. Credit cards as a share of household debt held by chartered banks remained constant from 1982 to 2010 at 7% per year. In 2010, the share of personal loans significantly decreased to 10% from 39% ion 1986. In 2010, the share of personal lines of credit increased to a whopping 25% from 3% in 1986 indicating that consumer and credit card debt has considerably outpaced mortgage growth. As was universally anticipated, the Bank of Canada opted to hold its target overnight rate at 1 per cent this morning. Ongoing uncertainty in the Euro-zone continues to weigh heavily on the Bank's outlook. In its statement accompanying the interest rate decision, it was noted that the bank is now projecting a contained Euro-crisis, but also a brief recession in the Euro-area due to ongoing deleveraging and fiscal austerity. The Bank also expects continued weakness, but no recession, in the United States through the first half of 2012 before a resumption of stronger growth. Given various challenges in the global economy, the Bank of Canada trimmed its outlook for Canadian economic growth to 2.1 per cent in 2011, 1.9 per cent in 2012 and 2.9 per cent in 2013 which is in line with our own forecast. On inflation, the Bank now expects slack in the economy to persist longer than originally forecast, leading to a closing of the output gap at the end of 2013. This implies softer than expected inflation in coming quarters, with consumer price growth moderating before returning to the Bank's 2 per cent target by the end of 2013. Overall, this morning's statement shows a very cautious Bank of Canada that is unlikely to make any significant movements on interest rates over the next two to three quarters. Further monetary tightening will be highly contingent on a brighter growth outlook in the United States and a credible solution to the Euro sovereign debt crisis. Therefore we expect the Bank of Canada to remain on the sidelines through the end of 2011 and the first half of 2012. The Canadian economy grew at the exceptional pace of 6.1% in the first quarter of 2010, propelled by a booming housing market, strong consumer spending and the rebuilding of private sector inventories. Moreover, growth in the second quarter of 2010, while not expected to register the sizzling pace of the previous six months, should be a robust 3%-4%. However there are signs that the economy, if not stalling out, may be slowing down. April’s monthly GDP print was disappointingly flat as consumers moved to the sidelines, sending retail sales lower by almost 2%. Even if Canadian consumers are beginning to tire out, economic growth should be supported in coming months by projects initiated under the federal government’s infrastructure stimulus plan. This stimulus will provide a needed boost to the economy through the remainder of 2010, with projected impacts peaking in the third quarter, but will create a drag on growth in 2011 as the stimulus is withdrawn from government expenditure. The strength of the Canadian economic recovery over the past six months is evidenced by the over 300,000 jobs created in the Canadian economy since the beginning of the year. While this exceptional rate of job creation stands in stark contrast to the gloomy employment situation of our southern neighbour, it also re-affirms the need for the Bank of Canada to begin withdrawing its emergency level of monetary stimulus by raising interest rates, particularly given the proximity of core inflation to its 2% target rate. The withdrawal of monetary and fiscal stimulus from the Canadian economy in coming months will result in slower growth in both the second half of 2010 and into 2011. This growth slowdown may be further exacerbated by weaker than currently anticipated US and global economic growth as well as a higher Canadian dollar resulting from a rise in Canadian interest rates relative to the United States. In all, slower economic growth and inflation that is within the Bank of Canada’s comfort zone should mean that, while interest rates are certain to rise, the pace of interest rate increases should be orderly and the level of interest rates will remain near historic lows through the remainder of the year.